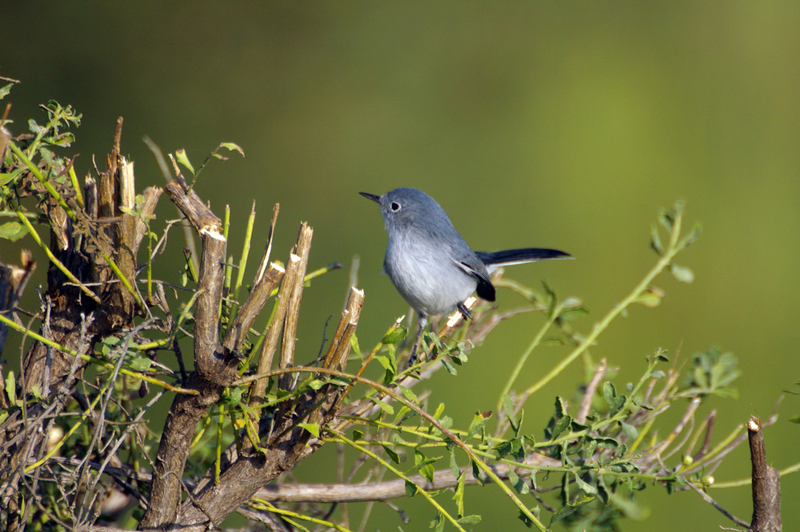 A tiny, long-tailed bird of deciduous forests and scrublands, the Blue-gray Gnatcatcher makes itself known by its soft but emphatic "spee" calls and its constant motion. By flicking its white-edged tail from side to side, the gnatcatcher may scare up hiding insects. 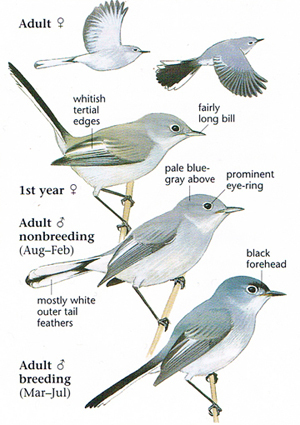 The Blue-gray Gnatcatcher is the northernmost-occurring species of gnatcatcher, and the only truly migratory one. 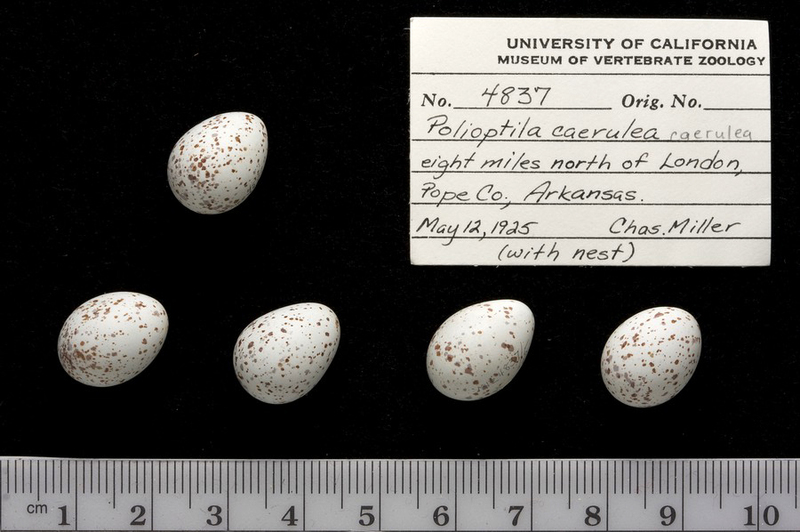 Most members of its genus are resident in the Neotropics. 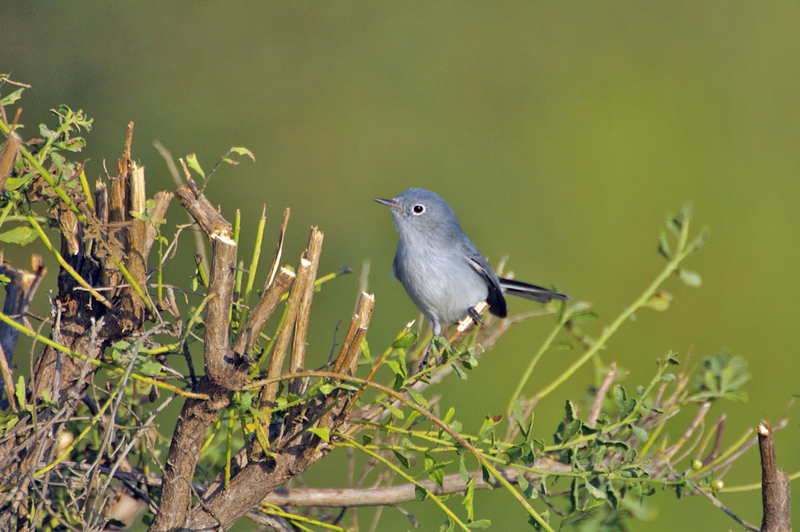 The soft, rambling song of the Blue-gray Gnatcatcher usually contains some mimicked songs of other bird species. Black line meeting over the bill and extending around head above the eyes to just behind the eyes. Crown and nape washed with bluish. Crown and nape medium gray. Face all medium gray. Face all gray, with white eyering. Overall paler gray than male. Similar to adult female, but wings slightly browner. Breeds in variety of deciduous wooded habitats from shrubland to mature forest, especially near water. Feeds near tips of branches, constantly moving through foliage. Moves tail continuously, which may flush insects. Cerulean Warbler with streaking on chest and sides, two wingbars, and shorter tail, lacks eyering and white outer tail feathers. Kinglets with greenish, with wingbars and shorter tails. Black-tailed Gnatcatcher with mostly black undersides to tail feathers, duller overall. Breeding male with black cap. California Gnatcatcher with darker underside and nearly all black tail. Breeding male with black cap. Rare Black-capped Gnatcatcher female very similar, with longer bill and more tapered tail. Breeding male with extensive black cap. Song soft, warbling, complex series of rambling jumbles. Call a thin, nasal "spee." Ellison, Walter G. 1992. Blue-gray Gnatcatcher (Polioptila caerulea). In The Birds of North America, No. 23 (A. Poole, P. Stettenheim, and F. Gill, Eds.). Philadelphia: The Academy of Natural Sciences; Washington, DC: The American Ornithologists' Union.